Does your improv feel strained? Do you have a hard time believing your own choices? Do you catch yourself pushing too hard for laughs? Or maybe pushing too hard to make a meaningful connection with your partner? It's easy to mistake effort for commitment, and too much effort can throw a show (and an improviser!) entirely out of whack. This workshop is all about minimizing effort and relaxing into the joy of your scenes. Get out of your head, get out of your way, and just let it be. 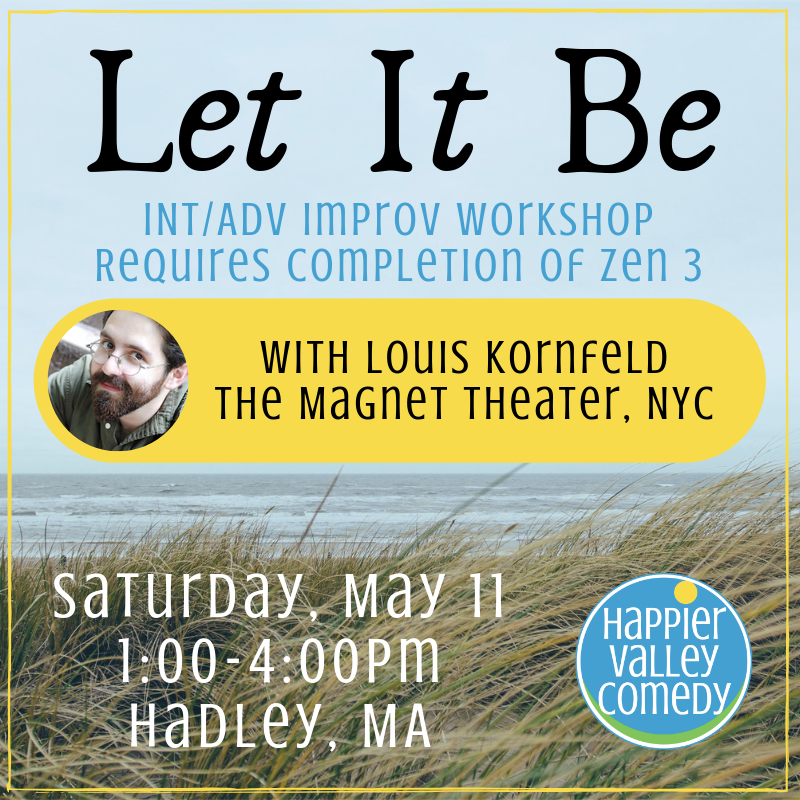 Louis Kornfeld has been a proud member of the Magnet Theater since it opened its doors, having logged countless hours as a performer, intern, house manager, member of 'The Boss,' Megawatt director, and (for the past twelve years) teacher of improvisation. What can he say? He loves it.In addition to improv, Louis is also an award winning writer and actor whose work is routinely featured on 'The Truth' podcast. Check it out, why don't you? You can see him performing every Sunday night with the great Rick Andrews in 'Kornfeld & Andrews' at the Magnet Theater in New York City (and on Saturday, May 11th at Happier Valley Comedy Theater!) Kornfeld & Andrews have some short videos online you might enjoy. Louis thinks you're doing great. unless we have 48 hours notice before the event AND we can get someone to fill your spot. *Our classes involve physical activity, and we could be on our feet for at least an hour. If that's an issue, please let your instructor know how we can accommodate the class to fit your needs. ​Please email us with any questions about accommodations for ability. The Happier Valley Comedy School admits students of any race, color, sexual orientation, gender identity or expression, religious affiliation, age, ability, national and ethnic origin to all the rights, privileges, programs, and activities generally accorded or made available to students at the school. It does not discriminate on the basis of race, color, sexual orientation, gender identity or expression, religious affiliation, age, ability, national and ethnic origin in administration of its educational policies, admissions policies, scholarship and loan programs, and other school-administered programs.